As Don and I get older – and as we lose the critical help of our farmhands, otherwise known as our daughters – we need to make sure we can still run the farm safely and efficiently without hurting ourselves. The single-most useful tool we’ve acquired in the 25 years we’ve been homesteading is the tractor. Having a force-multiplier has been immeasurably important. All the heavy lifting, all the rototilling, all the shoving stuff around – we can let the tractor do it. But the tractor can’t do it all. To this end, we’re looking at ways to work smarter, not harder. Many of these problem-solving techniques spring from Don’s amazing and creative brain. He’s been looking at what causes us the most frustration and difficulty, and/or what has the most potential for injury, and coming up with ways to change things. One thing Don built was an auger stand. 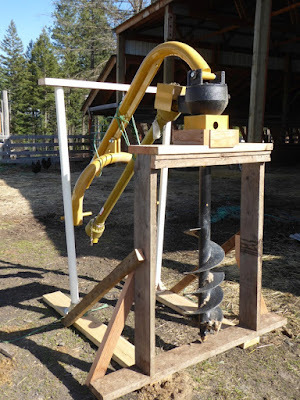 The spiral-shaped auger is used to drill holes. I can’t even begin to describe how many holes must be drilled on a homestead, usually for installing fences and gates, but also to plant trees, construct outbuildings, or even (sigh) to bury a pet. But the auger weighs a zillion pounds and has arms like an octopus. Trying to get a zillion-pound octopus installed on the tractor was a difficult and frustrating two-person job. The auger stand has made all the difference in the world. Now Don simply backs the tractor up to it and either drops the auger into place, or hitches the auger up. It’s a simple one-person job, and we haven’t bruised a shin or pinched a finger since he built it. Another huge source of frustration was cutting out cows whenever we needed to isolate them for whatever reason (usually butchering). Cows, as you know, are herd animals, and move together with a herd’s mentality. Separating cows was always an all-hands-on-deck occasion with 10-foot lengths of PVC as push poles and a lot of swearing as the animals dashed madly wherever they wanted to go. Without the girls, moving cattle became virtually impossible with just the two of us, so we had to find another way. 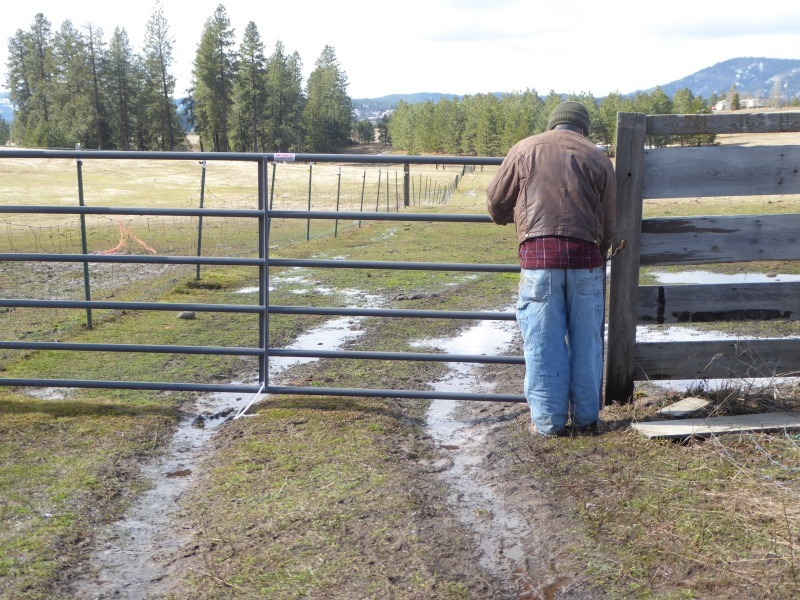 Don noted that if we installed gates at critical pinch-points on the property, we could create multiple temporary corrals which would allow us to shunt animals a few at a time without having to deal with the entire herd at once. 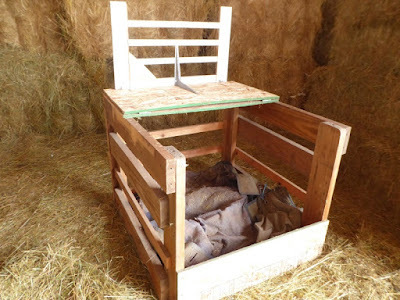 Another “smarter, not harder” thing Don built is the calf cage. Since calves are ALWAYS born at the farthest corner of the property, it became too difficult to carry a wiggling newborn a quarter-mile back to the house for either castrating or dehorning. To understand why, try this exercise: Hold out your arms in a wide circle, like you’re embracing something. Then have someone put a 35-pound weight in your hands. Still holding your arms out, carry that weight for a quarter-mile. And no matter what, you can’t put it down. Now have that weight struggle and wiggle and try to get away. Now have a hormonally deranged mother cow bellowing in alarm and dogging your heels. For additional fun, throw in another 10 or 20 animals, many with horns, who are excited and milling about, as you stagger that quarter-mile toward the barn with your arms outstretched around a 35-pound wiggling weight. Now do you understand the difficulty? Unsurprisingly, we’re finding the older we get, the more difficult it is to carry newborns calves out of the pasture. The calf cage changed all that. We strap it to the tines of the tractor and go fetch the calf. Tractors don’t bother cows, so we can get close to the calf, lay it gently in the cage (padded with an old horse blanket), and slowly drive back to the house with the mother either following behind, or easily shooed into the barn behind the calf. What a difference. My friend suggested I put up a blog post seeking input from readers about what tips and tricks they’ve found to help ease the homesteading workload, especially with older people. So I’m opening up the platform, folks. Give us your best ideas, suggestions, projects, and hacks that work. You’ll be doing everyone a favor in passing around the tricks of the trade. I'm not sure how you pressure can your stuff, but I always put my pressure canner on the stove empty, turn the burner on underneath it, and fill it with three quart jars of water. Mine only uses three quarts of water. Then I place my filled jars in the warming water as I get them ready. Once done canning, I turn off the burner and let the canner stay in place while it cools and loses pressure. Then I remove the lid to the canner and jars. I only have the three quarts of water to empty. Hope that helps. I don't move the canner until it has cooled and been emptied. Then it can be emptied just like the water bath. It means more time for cooling between loads but it saves my back. And I dehydrate a lot as well. The new electric pressure cookers will also pressure can pints. Mine is limited to 4 pints at a time. Some fancy new kitchens have a pot filler - a faucet on the stove so that you don't have to move a pot after filling it; you could get the same effect by adding a short hose to your kitchen sink (make sure to use a drinking water rated hose). To empty you can dip it with a large measuring cup or if you have a floor drain or low sink you can use a siphon. Have to agree with you. 110% on the best tool around. The tractor I have, with a loader, is smaller than yours. You looks like it might be in the 35 HP class, where mine is about 23. Have bigger tractors, but this is the one I go to. For your area, I would probably add a snowbloer to the list of implements. I have a blower on one of the garden tractors, it works well for this area, we do not get the drifting snow like you folks. Have a good week, stay cool. They are talking upper 90's to 100 or better here all week. looks like a watercolor painting to me. The ONLY answer you are legally required to answer to a census taker is how many people live in your home. For milking, I know someone who got one of the portable milkers. She carries it, and the results, to and from the barn in a child's wagon. We have 2 little red wagons, one with and one without sides. We use them all the time, to carry thing to & from the garden, cars, green house, etc. It's so much easier to pull the wagons than to push a wheelbarrow. The walking rows in the garden are wide enough to pull the wagons through. This came in very handy a few weeks ago when I twisted my ankle while gardening. Hubby just loaded me in the wagon and took me to the car for a trip to the ER. Wish they made an electric pressure canner that doesn't just replace the water bath canning. It would be nice to pressure can without having to struggle with the heavy pot and hot water. I bought a steamer canner and use it intead of a water bath canner. It uses a lot less water. Yes, I also have a steam canner. Super easy to use and to lift/empty. To your friend from Maine. There is a product that is easier on the hands and wrist that can be used to milk goats. It is at Hoeggers (thegoatshop.com). Check it out. I decided to butcher my last two goats because I could not fight the cougars that killed three of my goats. Yoga videos, seriously help with flexibility and avoiding injury when accidents do occur! 3x weekly. This is very true. I seriously hurt my back and pelvis and the only way I remain flexible enough for every day living is yoga poses. I don't do the contemplative yoga just the poses. My back pain and stiffness has gone down around 90% since I've been doing it regularly. Swimming helps too. It even seems to help with other medical issues I have although I don't know why. Just start very very slowly and work up. It's changed my life. To ease the strain on my back, I used some large landscape bricks to elevate my milk stand. Now I can sit up straight with my legs under the stand's platform....no more twisting at the waist! And the goats don't mind the height because there's a ramp at the end for them to simply walk up for milking. For haying, my husband is convinced that a round hay baler will be easier than our square baler. During baling season he thinks he could do far more of it on his own, and during the feeding season he thinks he could give them more at a time and save some labor. Not sure how this will work out yet, as so far the round baler is giving us fits :) About fencing, I like the pinch point idea. I have been looking at satellite maps (like google maps) and planning fence lines and driveways. Helps me visualize better. I agree with your husband on the round baler. We had struggled for years with the square baler. Bale the hay, then we'd have to load the hay on a trailer, then move the hay to the barn, then stack the hay. Then the reverse in the winter months to feed the cattle. Now we bale and use our backhoe to move the hay where we want it. Leave it there. Feed it to the cattle in the winter. So much less stress on these old bones. I have hauled hay for 40 years and love our round baler. My wife and I are growing older and find that gardening becomes more difficult every year. I have trouble standing up from a kneeling position without support, as when weeding. I have found that a common five gallon plastic bucket can be used to push myself up with my arms to a height where my legs can lift me up fully. The bucket doubles as a tote to carry tools, weeders, gloves, plant ties and all manner of items that I need while in the garden. Sometimes I will put a plastic colander inside the bucket when picking fruit like peaches or tomatoes. Then I can carry the picked fruit with one hand holding the bucket’s bail while the other holds my cane. We plant in 4’ by 8’ beds. We put a six foot T-post fence post in each corner. These provide a support when moving around the beds on unsteady legs. They also provide anchor points for bird netting and bed covers as needed. Have you thought about trying a cart likes those described above with the sides removed? you can sit on it (with a cushion) and with the right size also have tools or produce next to you. Gardening became difficult for me to bend over. I saw in a magazine someone use old upright freezers, took the door off, had it properly gutted of mechanicals and holes drilled through the back for drainage and then placed end to end to hide the compressor cavity and fill with dirt. it is about 30" tall and insulated so you can grow at an earlier time and not the back bending chore of weeding and planting. I have planted every thing in this way and they last for years. You can build a simple cold frame around them for an earlier start and have vegetables in early spring. I have friends that plant their herbs, onions and garlic in old cast iron bath tubs. Raised up high. Their other vegetables are planted in the large tubs that cattle feed comes in around here. Very little bending over and you can sit on the edge. They put 3 or 4 drainage holes about 2" from the bottom. Soil needs to be changed out or amended but no tilling and very little problems with weeds. We use a Simple Pulse milker on our goats and cows. Works great, and milks right into 1/2-gal mason jars or gallon jars from u-line. 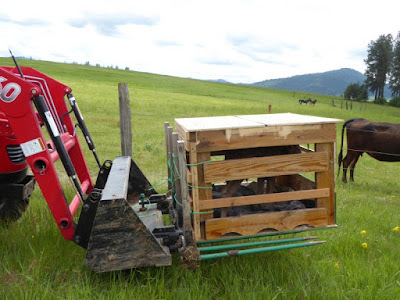 If you don't have power where you milk, you can add a battery and an inverter to the setup, and put the whole thing on a 4- wheeled garden cart for mobility. Simple Pulse is a bit spendy at $600 for a complete setup, but we've never regretted it. It's also made by an Oregon homestead family, so it supports good folks like us. This used to be generationally taken care of. Mom and Dad would tend the farm/ranch, teach the kids what was what. When they were too old for heavy work, the kids took over with mom and dad doing lighter tasks - shelling peas, husking/shelling corn, weeding, etc... The property was given to the new generation to maintain. This was mom and dad's social security. In the area I live there are still many family farms from the 1700's. Getting to be tough now with "death taxes" killing them. The Ohio Farm Bureau recently published an article on "passing" the family farm without taxes. Just hope it helps.. Retired engineer here. I sure have an appreciation for Don's problem solving skills and his creativity. One of the greatest labor-saving tools we have is a 24" snow sleigh shovel. No more traditional shovels for us! Scoop it! We're looking at a place with 75 head of grass fed beef. Huge uses the water like others would use grain. He opens the coral where water is and the cows pile in for a drink. If the few needed don't come he shuts the gate and puts out a salt lick. They Come in the next day. He built a water trailer with those big water totes and pumps from the pond. Hee also rigged a 4 wheeler for the electric fence he rolls out as he moves them to new pasture ever couple weeks. He built this frost free well system which is amazing. Super smart man. In his 60's been doing it alone for ten years. Inspirational. Pat's quick Hitch makes connecting equipment a safe, one person job. https://www.ruralking.com/pats-easy-change-cat-1-w-bar.html I wonder why I waited 25 years to buy one. It makes life so easy. The other piece of equipment that a farm needs is a PTO Generator. I purchased a used Winco Brand 25 KW Unit. 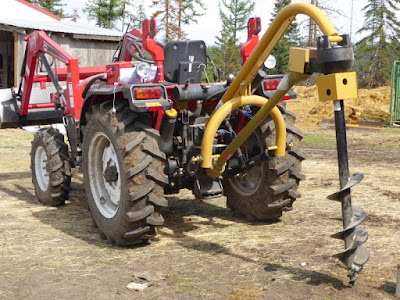 Connect it to your tractor and set the PTO speed at 540 RPM ad you have instant power. Since you use the tractor all the time you know that it will start unlike a portable generator hat has been in storage for a year. Raising dairy goats,pigs and chickens and using a lot of water from my outside faucet. Bending to clean, empty and fill buckets was taking a toll on my back and knees. First we used cinder blocks stacked to the correct height and it worked good. Now we have a set of wooden stairs placed right up against next to the building at the faucet. Now there are "four steps" of height to accomodate all of our helpers. Not to be a downer, but we gave it up and moved into our small rural town. We still can, sew and maintain our much smaller property. It was time to leave the big gardening and animal husbandry to the younger set. We can walk most places and do a smaller version of our prepping lifestyle. I'm with you on the "smaller version" lifestyle but we're not moving. We had hoped some of the younger family members would join/help us with the farm. But that hasn't happened. We only have chickens and bees but the garden has definitely gotten us down. Since there's only three of us we're transitioning to container gardening. WRT carpel tunnel syndrome and arthritis in your hands. You do NOT need surgery. Go to any drug store and purchase many pairs of compression gloves and a pair of wrist splints. The gloves I like best are Thera-Glove, but they all work about the same. I buy them at the annual quilt show but you can go online to Thera-glove.com. I wear the gloves for all dry activities like writing and sewing. I also sleep in them. Cold hands all night long exacerbate arthritis. For carpel tunnel syndrome, get the wrist splints. These are heavy gauntlets with a strip of metal that keeps your wrists from bending, allowing the nerve channel to recover overnight. Sleep while wearing them (over the compression gloves) every night and your wrists will start to recover right away. Wrist splints saved me from surgery. I've worn mine for several years now; I expect to wear them forever. I have no pain at all, despite the amount of handwork I do. I am 57 and have a family history of arthritis. The splints and gloves saved my 79 year old mother's wrists. WRT carpel tunnel syndrome: you do NOT need surgery. Go to the drug store and get compression gloves (several pairs) and wrist splints. I use Thera-glove compression gloves, which I buy from the annual quilt show. However, all brands of compression gloves work in similar fashion. Wear them for all dry work such as writing and sewing. Also wear them overnight since letting your hands get cold overnight exacerbates your arthritis. For the carpel tunnel syndrome, get the wrist splints. These come in sizes and pairs and you will need them for each hand. They look like heavy gauntlets with a metal splint inside. The splint keeps your wrist at the correct angle so the nerve tunnel can decompress and heal. Wear the splints every night while you sleep, over top of the gloves. Compression gloves and wrist splints saved me from surgery (I am 57) and they're saving my elderly mother now (79). We have a family history of arthritis. Expect to see results in a few days; it will, depending on the severity of your symptoms, take a month to see full results. Even if it doesn't heal you completely, you should be able to function without surgery. Re: carpel tunnel. I was on my way toward surgery and a friend suggested I try fascia massage instead. Find a place that specializes in this. It is painful (to the point that I swore I would never go back after the first treatment), but it works without surgery. They work on the same thing as the surgeons do, but without cutting. Like I said, the first time was painful and bothered me for about a week after, but I am now 100%. You may want to look into it. BTW, I love this topic as age is catching up to me as well. Thanks. Re: carpal tunnel. After 1st carpal tunnel surgery, pain came back. Heard about B vitamins; started taking them and have not needed surgery. Get your B levels tested or just start a B complex. Do your research for bioavailable vitamins. Also, strongly endorse wearing wrist splints at night!